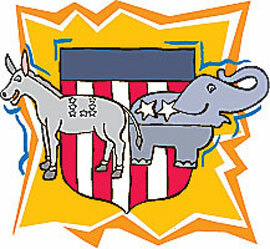 The democratic donkey and republican elephant are popular symbols that represent the main political parties in the United States. Photo from Eastern Michigan University, Focus EMU online. The U.S. political party system is called a two-party system, but in reality numerous political parties exist in the country. The two parties that receive the most attention and support are the Democratic party and the Republican party. Each party has a platform that explains the purpose and goals of the party. Platforms usually include a preamble, positions on current issues, and plans for meeting the party’s goals. Platforms often discuss important issues like employment, taxes, and national security. Today, Democrats commonly encourage government support of social programs while Republicans tend to support private business growth. The first political party in the U.S. was the Federalist party. Other parties later emerged including the Whig party, the Progressive party, and much later, the Green party. Lesser-known parties are referred to as “third” parties. The Democratic party was originally known as the Democratic-Republican party, but was later reorganized and then renamed in 1840. President John F. Kennedy and President Bill Clinton are two well-known Democratic presidents. The Republican Party became a major political party in the 1850s. Abraham Lincoln was the first Republican president. Other well-known Republican presidents are Ronald Reagan and George W. Bush.